Wait, Do You Really Need to Print That? Federal agencies spend close to $1.5 billion annually on employee printing, equating to about 20 billion pages a year, according to an industry report. These statistics alone justify a close look at how to better manage print budgets by automating the print environment. In fact, industry analyst Gartner predicted that by implementing a managed print environment, organizations could save 30 percent or more in print costs. Four factors have the most impact on print costs: page volume, number and type of print devices, and labor and backend architecture for printer support. An effective print management solution addresses these four costs at the enterprise level. The General Services Administration aims to change employee print behavior with its PrintWise campaign, which could save more than $330 million by 2015. Creating an enterprisewide framework with specific outcomes and measurements is the first step, including integrated print management capabilities, secure distribution of documents to printers, output control and real-time monitoring of device status. An automated method offers printing metrics and advanced rules-based printing across an entire fleet of devices. Centralized tracking and reporting. Detailed metrics on print output provide insight into print behavior, including content and origin of printed documents by user and department, the time and day of printing, the application it was printed from, the document name, page count and file format. With this data, trends can be identified at the user, department and enterprise levels. Pull printing. With this approach, print jobs are held in users’ queues until they sign in and release the job from any integrated networked multifunction device. User identification at the printer eliminates the need for desktop printers while protecting information, such as patient records at Veterans Affairs Department hospitals. 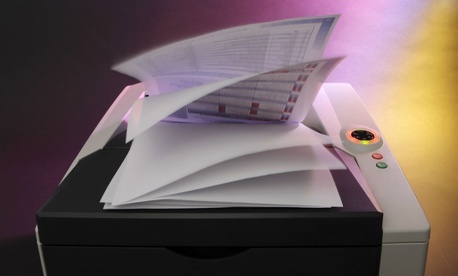 Pull printing also can reduce page volume by 20 percent and eliminate the exposure of sensitive data when unclaimed documents are left at the printer. Queues can be configured to automatically delete unprinted jobs after a specified period of time. Print management can be integrated with government-issued common access or personal identification verification cards, which require two-factor authentication to access network data. Rules-based printing. Rules established at the enterprise level control output by analyzing print jobs and are enforced based on the user, the application printed from and attributes of the print job (i.e., number of pages, single-side/duplex or color requirements). Rules can be established for redirecting large print jobs to a production printer, rerouting to the lowest cost networked printer, or to an authorized printer if a document contains words like “confidential or classified.” Rules can leverage any attribute of the document to enforce a specific print policy. Eliminating the printed page altogether is another cost-saving alternative when working with specific types of data systems. By capturing and converting data from mainframe systems and routing it into an electronic delivery workflow, a print copy is not needed. Print streams are converted into PDF format for electronic delivery to a user or application. Centralized management can save costs through proactive monitoring of networked devices and tracking the status of desktop printers. When printer problems occur, a notification is delivered to the IT staff to alert them of the problem and to reroute print jobs and notify the user of the new print destination. The extensive amount of industry research and corresponding government policy provides overwhelming justification for paper-intensive organizations to implement a strategy to realize long-term, sustainable operations and print costs. In a three-phased approach, the first phase should be dedicated to tracking print output, the second to deploying pull printing and the third to full enforcement of rules-based printing. Alexander Welsh is director of the Federal Government Practice at Notable Solutions Inc.